I don’t know about you but summer evokes special memories for me. Taste, sound, and smell all mingle to bring about the most treasured times of my life. 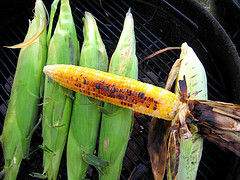 One of the best things I remember about summer is having a nice meal outside – with several fresh and sweet cobs of corn. Now isn’t that just wonderful? PYO farms are an excellent source of super-fresh cobs (go to pickyourown.org). Corn is coming into season now and should be available until late September. If you pick more than you need, cut off the kernels, blanch briefly in boiling water and freeze. Don’t add salt when boiling, though, because it toughens the kernels. British-grown organic corn on the cob, from areas such as Cambridgeshire and Lincolnshire, is available through nationwide organic box providers including Riverford (riverford.co.uk) and Abel & Cole (abelandcole.co.uk). But that is not all of it – they also give tips on how to find the best corn in markets and shops. If I were you, I’d read up on this a bit more and serve only the best corn in your next summer bash.